aLeft, The Namesake cover; right, Jhumpa Lahiri. In almost every page of his writing,'' the critic Edward Thomas once complained about Walter Pater, ''words are to be seen sticking out, like the raisins that will get burned on an ill-made cake.'' Such is the state of literary prose these days: it is often so fine, so self-conscious, so unappeasably literary that it is awful, a cake baked almost exclusively from burned raisins. 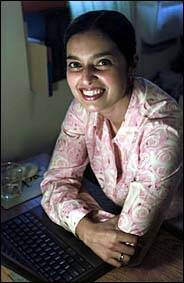 But an antidote for all these shticky, overprized Big Fiction doorstops quietly appeared in 1999, the short-story collection ''Interpreter of Maladies,'' by a young writer named Jhumpa Lahiri. Written in an elegant hush—even upon rereading, there isn't a single burned raisin in the mix—Lahiri's stories traced out the lives of various Bengali-Americans suffering through various stages of lovelorn distress. Lahiri herself was born in London, raised in America and is of Indian descent. With a background similar in outline to that of Zadie Smith, she nonetheless arrived at an entirely different imaginative enterprise. She renounced the writerly flourish, never once played the exotic and—perhaps most astonishing—scaled her characters to actual human existence. (In a typical Lahiri story, we find ourselves milling in and around Harvard Square. Her eye is keenest for that pleasant, humdrum drift of academic life when one is not an eminence.) Self-effacing as it was, ''Interpreter of Maladies'' became a word-of-mouth phenomenon and eventually won a Pulitzer Prize. It was that rare success: remarkable for being so thoroughly deserved. How like Lahiri to have a name passed down along such a peculiar and delicate chain of accident. Significant as it is for the reader, ''Gogol'' only fills the young American Ganguli with feelings of dissonance and shame. Like Stephen Dedalus, who stared at his signature on the flyleaf of his geography book, most of us slip through childhood's first existential porthole and find our own names profoundly alien. But the feeling infiltrates young Gogol's entire life. Later, as a New York architect, Gogol will fall in with a circle of friends headed up by a couple named Donald and Astrid. These people haven't been named, we think, so much as branded -- he's supposed to sound like the son of a do-right corporate preppy, she the daughter of a wannabe Beatle girlfriend. Guggenheim-leeching artistes, they form—together with their baby, Esme—a little bobo ensemble we are plainly meant to detest, down to their Florentine sheets and their stainless steel stockpots. Lahiri, however, is not a wit, and her tonal commitment to that trademark hush never wavers. Absent proper kinship ties, she seems to be saying, this is how Americans feel most at home: among their things. Refined as it may be, consumerism has touched these characters to the core; they merit nothing better than such status descriptors. As Gogol moves into young adulthood, he becomes that classic case: the charmingly spazzy, high-achieving mild depressive who doesn't yet comprehend how alluring he is to women. It is women -- of varying caliber, but pistols one and all—who take him by the lapels, shake him awake to life's charms and inject the chronology of his life with some zest. We get Moushumi, who announces, at 13, ''I detest American television,'' before returning to her ''well-thumbed paperback copy of 'Pride and Prejudice' ''; Kim, who, reeking of nicotine and college, first inspires Gogol to re-dub himself Nikhil; and the elegant and sly Maxine Ratliff, whose parents—old-money culture snobs who have mastered the art of inconspicuous conspicuous consumption -- slowly take over Gogol's life. Here Lahiri's narrative, as it portrays the Ratliffs' stupefying commitment to the good life, takes on a dash of Edith Wharton. How they love their Antonioni double features at the Film Forum and, in New Hampshire, their Adirondack chairs and farmstand corn. They induce in the reader, and in Gogol himself, a pleasant trance, through which aversion heroically fights its way to the surface. It's as if Lahiri were saying: in America, where so little is suitably customary or ceremonious, there might at least be this. Memory, unaided by even a photograph, lays a claim on us that is so much more exacting for being so perishable. This is my novel, such as it is, Lahiri is also saying: in a world of eroding kinship, the story of one modest, haphazard stay against oblivion, summed up best, of course, by the name Gogol.